I’m one of those gals who likes to celebrate her birthday all month long. Following a luxurious sushi dinner with The Astronomer, my friend Sam and I whooped it up over down home noodles at Chin-Ma-Ya in Little Tokyo. It’s one of his favorite haunts in the neighborhood, and I’m always up for some hauntingly good noodles. 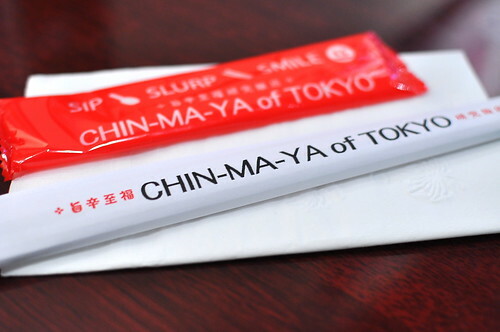 There are well over one hundred outlets of Chin-Ma-Ya in Japan, where the restaurant is originally from. The first U.S. branch opened in Little Tokyo in 2009. The most cost effective approach for eating in Little Tokyo is to order a “combo.” Chin-Ma-Ya offers over half a dozen of these unbeatable deals, including a gyoza and ramen combination for $9.60. 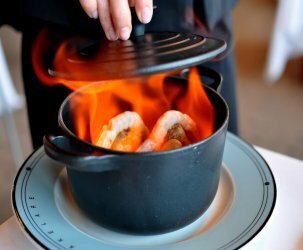 I originally ordered that combo, but subsequently opted for a la carte after catching a glimpse of the portions. I wouldn’t normally shy away from a gigantic bowl of noodles, but I had to play it safe considering I had a whole month’s worth of birthday celebrations ahead of me. 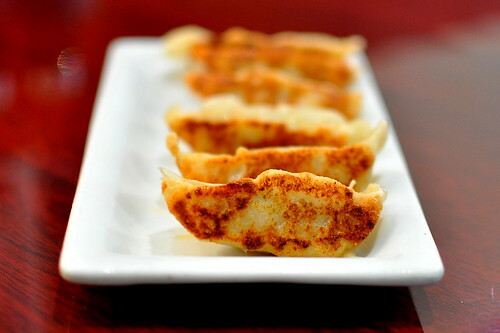 The gyozas ($4) were the first to arrive at the table. Expertly seared and filled generously with pork, the dumplings were most satisfactory. Sam ordered a side of karaage (Japanese fried chicken) to supplement his noodles. It was served with a chili-mayo sauce and a lemon wedge. The nuggets were lightly battered and very crispy. I liked how the ratio of meat to batter was skewed toward the latter. 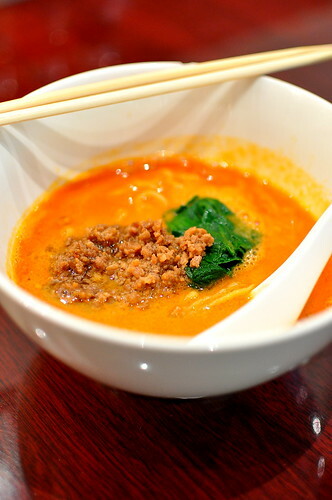 Sam and I both ordered half-size portions of the Tan-Tan-Men ($4), extra spicy and with Temomi noodles. 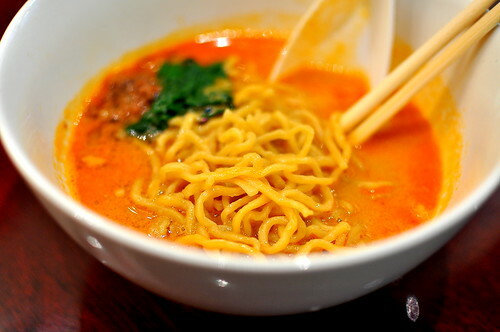 Tan-Tan-Men, which is one of Chin-Ma-Ya’s specialties, is a Japanese interpretation of Chinese Dan Dan noodles. Our noodles arrived steaming hot and topped with ground beef and pork, a pouch of wilted spinach, and a shimmery orange broth. 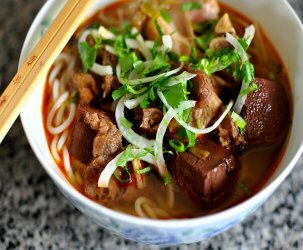 Made from a blend of chicken and pork stock, chili oil, and sesame paste, the Tan-Tan-Men’s profile was rich, creamy, and slightly peanut buttery. 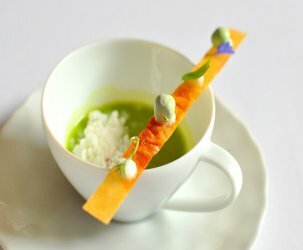 The spicing was mellower than I expected, allowing the broth’s distinctly nutty notes to shine through. The curly and slightly firm Temomi noodles were a fine accompaniment, although not necessarily an upgrade from regular ramen noodles. Both Sam and I slurped our bowls clean, noodles, broth, and all. Clearly, the mark of complete satisfaction. extra spicy!? how brave of you two..especially drinking all the soup! Wow a month long birthday celebration. That is some serious eating! NOODLES! And peanut buttery ones at that! I may have to hit up Sam Kim when it’s my birthday month. Think he’ll be my Chin-Ma-Ya guide? 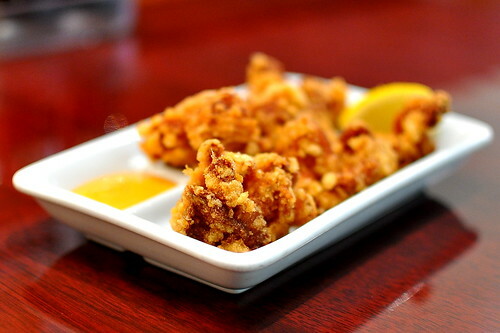 I love karaage, and that looks like one of the better versions I have seen. Just went last night! Being the spicy weaksauce I am, I opted for the goma and loved every single bite. Sooo much better than Orochon above. I’m a big advocate of the birthday month. Glad to see you’re enjoying yours! I would LOVE to have this for lunch today. It’s a damn solid bowl of ramen. I really enjoy the dan dan mein and love the 99cent HH for a mug of Sapporo. I love this outlet and didn`t know there was one in the states! Here in Japan the tan tan men noodles are straight and really thin and delicious.